This item qualifies for free shipping to the continental U.S. only. For all other shipping zones, please add the item to your cart and enter your zip code/postal code, state/province and country to get a shipping quote. Gear Shift Position Sending Unit for use with all Dakota Digital RTX, HDX, VFD and VHX Instrument Systems, Gear Shift Position Indicators and 12 volt LED indicators. Includes: Universal Mounting Hardware to fit all automatic transmissions including TH350, TH400, 700R4, 4L60, 4L80, Powerglide, C-4, C-6, and AOD, Mopar transmissions and many others. Fully push button adjustable with no magnets to align! Built in Neutral Safety Switch and Back-up Light Circuit. Decoder can be mounted inside the vehicle for easy access. 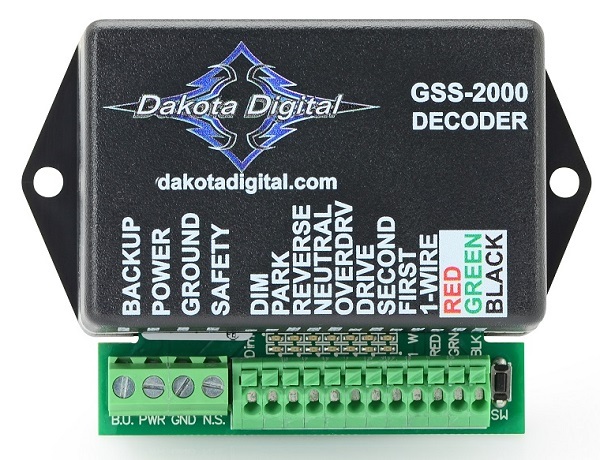 **Dakota Digital gear position indicators sold separately (available for purchase in our store).